Could it be that investors are beginning to fear that the boost to profits and sales that the Trump tax cuts generated is soon to be over? 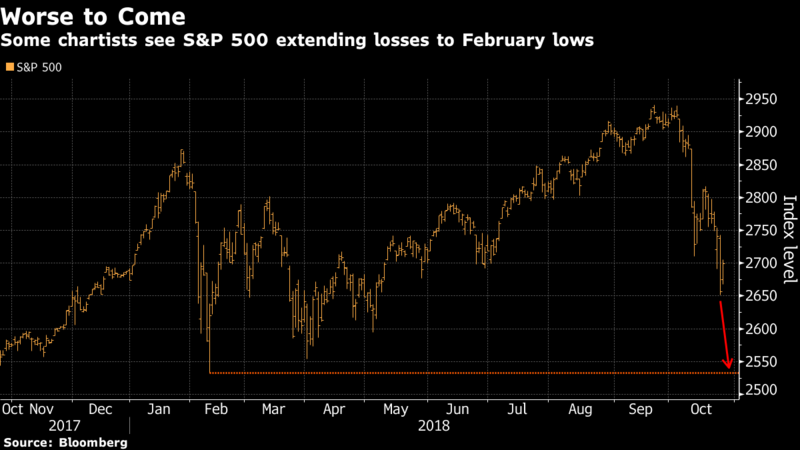 The US stock market turned volatile this week and has now erased all the gains made up to now in 2018 in just a week or so. So much for Trump’s boast that things for rich investors have never been better. 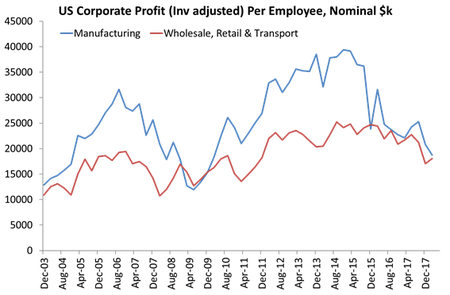 The fall in the US market has been matched by similar drops in the European and Asian stock markets. The all-world index has had its worst performance since the Euro debt crisis of 2012. Now this fall could just be what market traders call a ‘correction’ and not a full ‘bear market’, when the prices of shares enter a long and deep decline. But it could be that investors are beginning to fear that the boost to profits and sales that the Trump tax cuts generated is soon to be over, while interest rates (the cost of borrowing to invest or buy back shares to boost prices) are rising significantly. CitiBank’s ‘global economic surprise index’ — which measures how often data comes in better or worse than expected — has been in negative territory since April. That is the longest sub-zero stretch in four years. 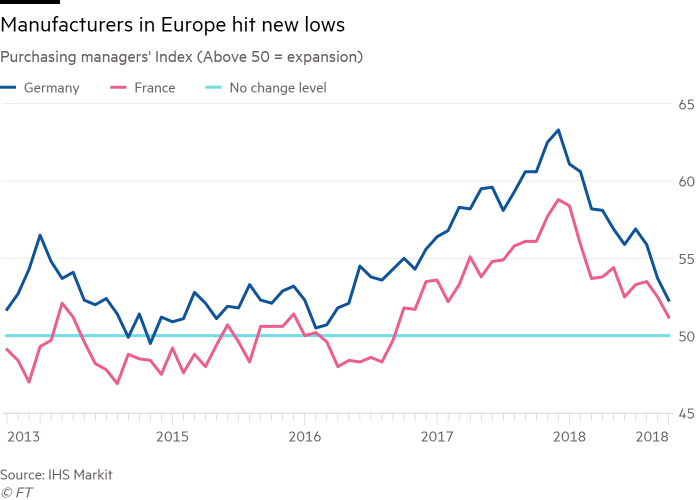 A slowdown in growth is pretty clear in Europe, where the measures of business activity are showing a significant drop in the pace of expansion. The IMF in its latest report has already signalled the coming slowdown but lowering its forecast for global growth by a couple of notches. And within sectors, there are serious declines; the global materials sector (manufacturing basic inputs for production) is down 20%. ECB chairman Mario Draghi said in his press conference yesterday that there was a “weaker momentum” in Europe, but this was just temporary and really just to do with German car sales and Italy’s budget. Next quarter will be better. And it is not just Europe that is slowing. China’s growth rate has been slowing since 2014, as the government tries to reduce debt in local authorities and industrial firms. In Q3 2018, the real GDP growth rate slowed to 6.5 per cent, the slowest reading since the 2009 post-crisis nadir. Falling profitability and the trade war with the US is beginning to have some effect. And South Korea also appears to be slowing down with Q3 real GDP growth of 2% being the slowest expansion rate in nine years. Investment dropped 6.5%. However, unlike the rest of the world, the US economy still looks better. The latest business activity surveys showed steady expansion. And globally, the price of copper – a good leading indicator of global activity – remains above the ‘recession’ level it fell to in the growth trough of 2015-6. However, investors are beginning to fret that the corporate profits growth seen earlier this year is as good as it will get, given rising wage costs, interest bills and materials prices. Moreover, the impact of the 2018 tax cut will make this year’s results hard to beat in 2019. The third-quarter results of 3M and Caterpillar, two US industrial bellwethers that reported last Tuesday, feed this concern. 3M cut its earnings forecasts. While Caterpillar’s profits beat forecasts, its warnings of rising materials costs rattled investors. The US may have reached a new trade agreement with Mexico and Canada to replace the Nafta deal reviled by President Trump, but Washington remains at loggerheads with China, slapping $250bn of tariffs on Chinese goods and demanding sweeping changes to the country’s economic policies. After occasional hints of a thaw, the imbroglio appears to have reached an impasse. If there is no progress in the coming weeks, the Trump administration is expected to introduce another $200bn worth of tariffs — perhaps sanctioning all Chinese imports. And investors remain on edge about the impact of rising interest rates on both fixed-income and equity markets. The Federal Reserve is expected to lift rates for a fourth time this year in December, and is slowly but surely shrinking its balance sheet, which has been stuffed with bonds acquired when combating the financial crisis. Former Fed chair Janet Yellen sounded a warning that the planned hikes could cause a new financial bust as many companies have taken out what are called ‘leveraged loans’ which are subject to sharp changes in interest rates. Yellen commented that “If we have a downturn in the economy, there are a lot of firms that will go bankrupt, I think because of this debt. That would probably worsen a downturn.” Indeed, it is estimated that nearly 20% of US firms are already finding the cost of servicing their debt greater than the earnings to cover it. Yellen also pointed out what current Fed Chair Powell has observed, that it was not clear what the appropriate Fed policy interest rate should be to ensure full employment and moderate inflation; there was “genuine uncertainty”. In other words, the Fed has no idea what it was doing in raising interest rates. Other central banks are also trying to ‘normalise’ monetary policy and turn off the money flow. The European Central Bank plans to end its own bond-buying by the end of the year, and even the Bank of Japan is easing back on its monetary pedal. The net effect of this is what investors have dubbed “quantitative tightening”, a sea change in the global monetary environment since the financial crisis that bodes ill for markets in 2019. Back at the beginning of October I wrote that if the Fed is wrong and the productive sectors of the US economy do not resume ‘normal growth’ (the average real GDP growth rate since 1945 has been 3.3% – so growth is not back there yet), the rising costs of servicing corporate and consumer debt could lead to a new downturn. The first estimates of real GDP growth figures for the US in the third quarter to September are out tomorrow. Most important, corporate profits, after a stellar two quarters are beginning to fall back. If you strip out financial sector profits, then corporate profits are still below levels of 2014, even after Trump’s tax boost. And in the productive sectors of the economy, like manufacturing, they are falling quite sharply – as measured per employee. The stock market is not always a harbinger of what happens in the ‘real’ economy, but it may be this time.